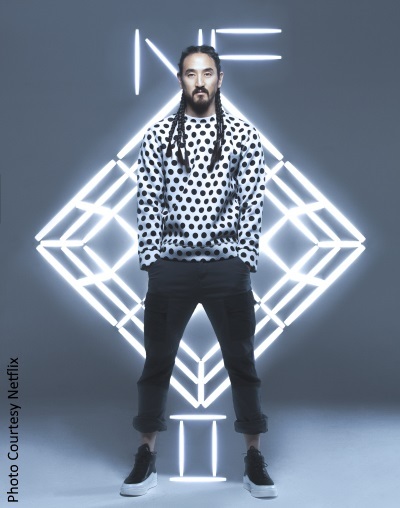 World-renowned record producer, musician and DJ Steve Aoki has been keeping busy. From a new hip-hop album to a Netflix documentary, he has a lot going on. 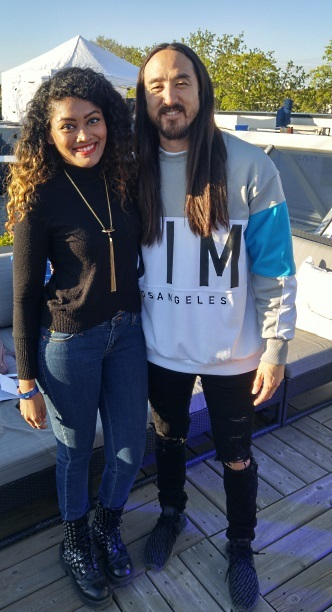 One of his projects includes a collaboration with Bud Light Living Canada. They recently unveiled Bud Light Living Rooms, a once-in-a-lifetime experience that can be purchased as an exclusive package. In collaboration with some of the biggest names in NFL, electronic music, and UFC, Bud Light Living Rooms is a marketplace that enables Canadians to experience what it's like to live like a celebrity -- from VIP transportation to special festival entrances. Currently, you have the chance to book the "Live like a Headliner" Bud Light Living Room at Dreams Festival, curated by Toronto's DJ Dzeko. Speaking of this campaign, what is an ideal experience that you curated for Bud Light Living? When they asked me to join, the first thing that came to mind was my studio. It's where I create my music. My studio is where everything starts. I call it the Neon Future Cave. It’s a bunker in my house and the colors are really important. So the colors are striking blues and whites and grays and blacks. So I made sure the rooms resembled that energy. I want it to be a lit environment. I want people to have fun and get crazy with music. You got to have the right energy and vibe. So you have to combine all those elements to get the Aoki experience. Plus, my new album Kolony is coming out. It's a heavy hip-hop feature with Migos, Lil Yachty, Lil Uzi Vert, 2 Chainz along with Canadian producers like DVBBs. You’ve taken DJ-ing to a whole new level. You’re known for your energetic and infectious performances. You bring personality to dance music. What motivates or inspires you to keep going? It's like when you build a house. You sit down and start building and you're done with what you think you wanted and then you think you can always keep changing and improving. That's my life. It's constantly building out this house. There's always new goals. Momentum – I always say momentum is everything in my life. I keep rolling. I'm definitely not a person who takes a vacation. No (Laughs). I feel like that's not me. I feel uneasy if I'm not working towards something. And even when I take a break it has to be purposeful. I don't sit on the beach in the sand or put my feet up and watch TV. You have so much energy when putting on a show. How does it not drain you? Energy creates more energy in my world. The more energy I give, the more energy I get back. I also believe in this idea of flow. When you're in the moment of flow and if you get out of that, it's really hard to get back in. I'm also very very grateful to be in a position to work with all these people that I do and if I lose that feeling, I'll become jaded. I haven't gotten there yet. I heard you're collaborating with Vin Diesel on a "monster track." What can you tell us about that? Will we get to see, or rather hear, a different side of Vin? Vin and I have been friends a long time. He's a musical guy since the day I met him. I knew we were going to do music together, I just didn't know when. Every time we saw each other we'd be like, "We got to make some music." Finally, we sat down and we were talking about something and he said, "Give me some inspiration." So I said, "I have a song specifically for you that I want you to sing on." I FaceTimed him and played him a song and he immersed himself in the role of the song as he does so well with acting. I know he listened to the song a million times and while he was in that moment, he flew his private jet over to my studio in Vegas and he landed like 2 a.m. in the morning and we worked until the crack of dawn. He's such a hard worker and it's amazing to see that kind of energy and passion to deliver something unique. I was able to help produce something out of him. It's going to be something that people won't expect. Your record label turns 21 this year – that’s such a milestone. You are responsible for developing artists like The Chainsmokers and Zedd. What's the one thing you look for when you decide to give artists a platform? They have to make me feel something. Music is a tool to make you feel. Does it compel you? Does it inspire you? Does it challenge you? If it doesn't do any of those things then it's not meant for me personally. If I get that feeling, then I'm going to explore and investigate. I built my career on identifying what has moved me. It's not just music, but in fashion and anything creative, it's about being able to identify. I heard a lot of actors spin at parties. Who in your experience has been the best DJ? One thing when I DJ with a non-DJ, I'm not basing it on their skill level because they are brand new. In that regard, I look at how they are able to look at a room and connect with the people and the music they like. In my earlier days, I was doing a lot of DJing with actors and celebrities and because I was playing a lot of smaller Hollywood parties. I have to give credit to Lindsay Lohan. We used to hang out a lot 10 years ago. I DJ'd for her 21st birthday at her house. She'd always come to my parties and she would always play things and I'd be like, "I can’t believe you know about this song." Now it's come to the point where actors know the underground, they know things about music that you wouldn't expect. Ruby Rose is also really good. She really is a DJ though. She opened for me in Ibiza. She's an excellent DJ. I saw your Netflix documentary, I'll Sleep When I'm Dead -- it was so heartfelt. Almost a glimpse into your world. How important was it to tell your story? The documentary, the way I see it, is now in the property of everyone else. I’m glad to let go of it. I haven't seen it since we dropped it. It's a therapy session to the public. I was glad I was able to find that level of intimacy where I can talk about these things. Because now in retrospect, I understand how it can relate to a lot of people and their own family history and find inspiration and develop their own careers. I'm happy that that transparency and vulnerability can comfort people. 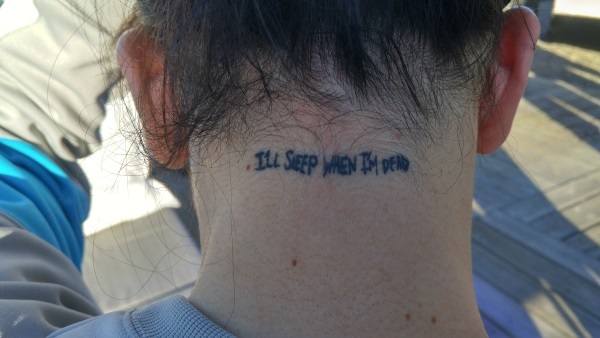 So your mantra is "I'll Sleep When I’m Dead?" Yeah, I even have it tattooed on my neck! No way! We are getting a photo of your tattoo. Thank you so much for chatting with us. Yeah, of course. You did your research. Thank you!